One of the services we render as an SEO agency in Nigeria is website auditing. We audit websites to find out why they are not ranked on Google. Gone are those days when bloggers can get to the first page of Google without a focus or niche keyword. SEO has changed over the years and before one can get a solid rank on search engines, you need to convince them that you are on authority in that Niche. Remember search engines were created to help people find answers to their queries! So if you are the type that writes a post about Buhari today and then post on Blaue Waffel the next day, then you might be confusing the search engines on what you really want to be known for on them. My Advice: Pick a niche for your blog and then come up with posts using several keywords in that same niche that you will want your blog to show up for on search engines. The importance of meta properties (Meta title, Meta keywords) cannot be overemphasized when it comes to search engine ranking. Your meta titles are the titles that show up on search alongside your website as shown below. You should ensure that both your title and description contain the keywords or set of keywords you want your blog to get ranked. Keyword density can be defined as the total amount of times a certain word is mentioned in a post compared to the overall number of words the post has. The number of times the keywords you want to rank for on Google are mentioned within your posts can also affect the probability of it rankings. From our research, we noticed that most bloggers in Nigeria under optimize their keyword density. Below is a chart showing the average keyword density you should use on your blog. Below is the formula for calculating keyword density on your blog. You can also use the tool here to automatically calculate it. Believe it or not, backlinks (links from other sites pointing to your site) is one of the core factors used by search engines to know who to rank for what. From over 300 Nigeria blogs that we audited, 87.67% of them don’t have any solid backlinking profile. Some of them have superb contents that are worthy of being ranked on Google but there is no juice from other websites to support it. So if you are a blogger and your blog isn’t getting as much traffic as it should from search, then you should check your backlink profile. That’s all the 5 points we’ve got for you today! What SEO challenge are you currently facing with your blog, tell us via the comment section and we will be glad to help. Did you notice any drop in ranking or traffic across your website in the past few days or Month? It is probably due to one of the recent Google’s algorithm update. Recently, an American e-commerce store contacted us to help recover the rankings of their website, their site lost over 70% traffic overnight. Revenue decreased and the owner of the site was on the verge of giving up and sacking his entire staff force. 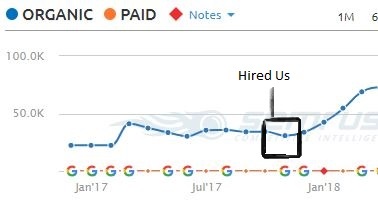 We took over the website and within one month of intensive SEO on the website, we recovered the traffic of the website and the traffic still keeps growing. If you have a website that was affected by the last Google update, fill in the form below and we will have a look to see if we can help you recover your rankings and traffic. This in most cases, takes about 2 months or less and we have an 80% recovery success. Your website is currently being Audited. Expect a Mail from us Soon! Very insightful and educative. Thanks. I’m glad it helped. Thanks for visiting ZEODigital. @pedrodias SEO died two years ago!